Artist Matt Kleberg is a native Texan, who now lives and works in Brooklyn, New York. Taking inspiration from architectural facades, textile designs, altars, and modernist paintings, Kleberg "constructs" his own visual spaces. Lines become stripes, stripes become panels, and rhythmic panels become environs in his works - a simple, direct, yet impactful approach. MATT KLEBERG, 37th Hour, 2017, oil stick on canvas 72 x 58 in. Courtesy of the artist. 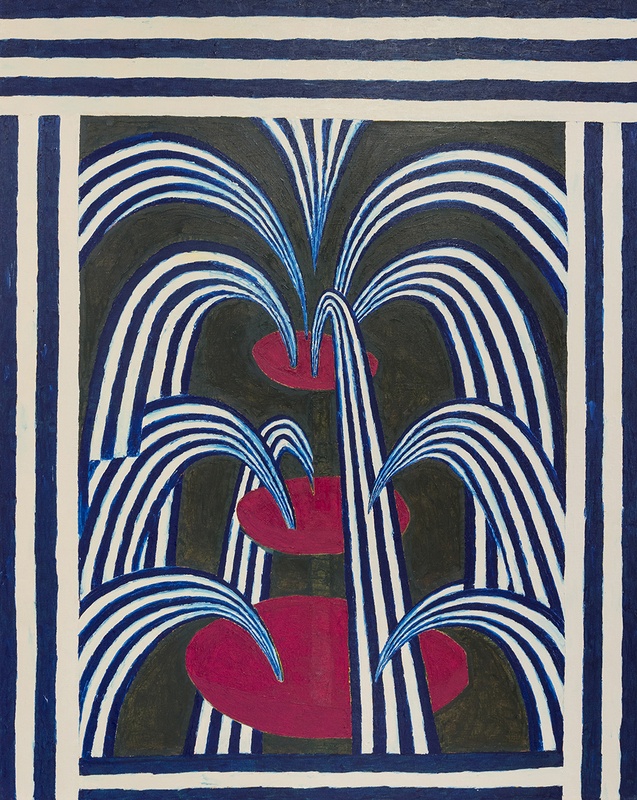 Kleberg purposely limits his visual vocabulary to intensely colored stripes applied in serial repetition. The "artist's hand" is allowed to show as he applies fluid lines that are far from mechanically drafted. The resulting manifestations seem structurally suspect - a quality fully intended by the artist. The surfaces are unrefined, utilizing oil stick on canvas that naturally provides a textured surface to enhance the illusion of depth. The disorienting perspectives combine with the not-so-subtle colorist grab the viewers' attention and draw them into his fabricated spaces. These theatrical "stages" are void of any depicted actors; instead, the view becomes the participant within the interior of the illusionary architectural spaces. Kleberg's humorous yet incongruous titles derive from the influence of Southern Gothic writings from which he also draws inspiration. The Get-Down, Hypnobaby, Idle Warship are far from from descriptive of his more stoic visual narratives. Their presence suggests another layer of perplexity to the paintings' inherent contradictions. This OJAC exhibition is Kleberg's first solo museum exhibition in his home state of Texas. Matt Kleberg: Warp and Weft is sponsored in part by Ginger & John Dudley, The Helen K. Groves Fund, Blair & Joseph Fitzsimons, Brenda & Glenn Picquet, Michele & Rob Arnot, and Susan & Robert Montgomery. MATT KLEBERG, Hypnobaby, 2017, oil stick on canvas, 96 x 72 in. Courtesy of the artist. MATT KLEBERG, High Water Railers, 2015, oil and oil stick on canvas, 60 x 48 in. Courtesy of the artist and Hiram Butler Gallery. MATT KLEBERG, The Get-Down, 2015, oil stick on canvas on seven panels, lumber and bricks, 83.5 x 85 x 10 in. Courtesy of the artist and Hiram Butler Gallery.